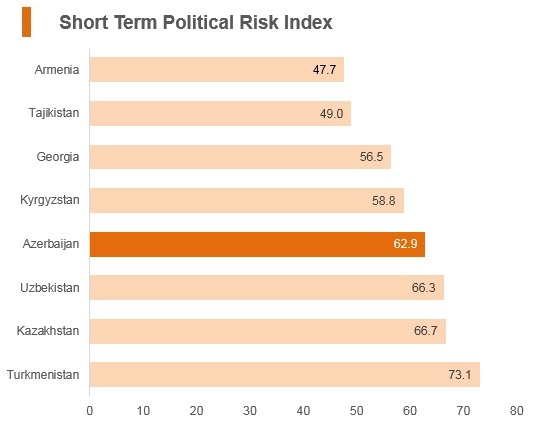 The main challenge facing Azerbaijan is to preserve the reform momentum since the economic shock of 2015-2016 and strengthen institutions to increase the economy’s resilience to future external shocks. 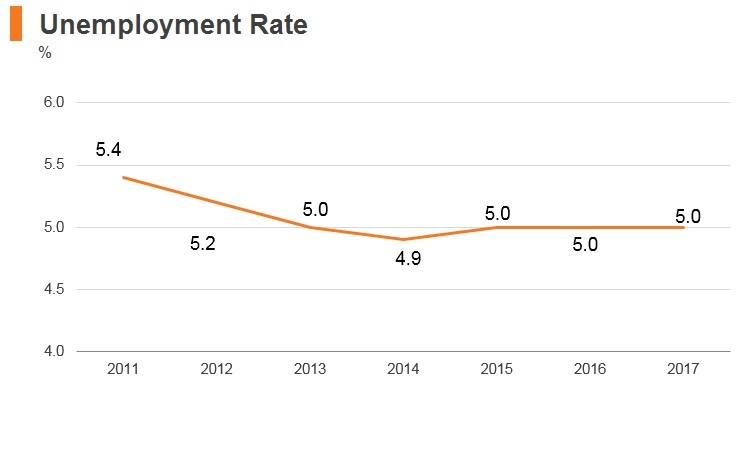 The economy had a modest recovery in 2017. Benign public financing, improved confidence, and a favourable external environment supported non-oil economic growth, but this was offset by a decline in oil production. Going forward, growth is expected to strengthen, driven mainly by a fiscal stimulus, a rise in hydrocarbon prices, and an increase in gas exports. 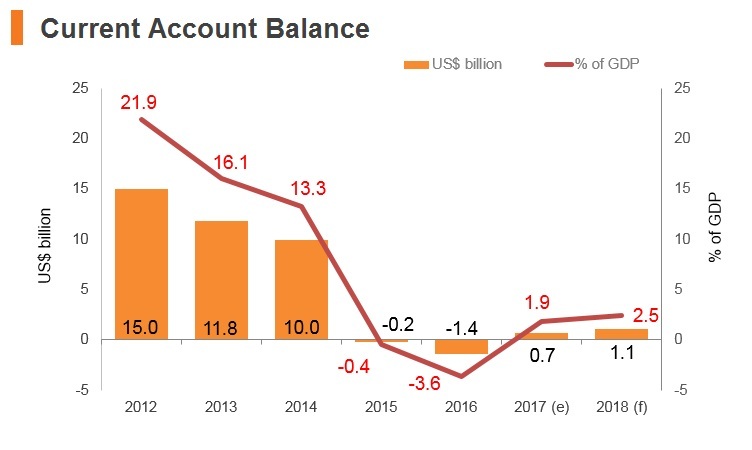 There were signs of recovery in Azerbaijan’s financial sector in 2017, supported by the stabilisation of the managed exchange rate and growth across the non-oil sectors. Ruling New Azerbaijan Party won parliamentary elections, which main opposition parties boycotted. President Aliyev appointed his wife, Mehriban, as first vice-president. 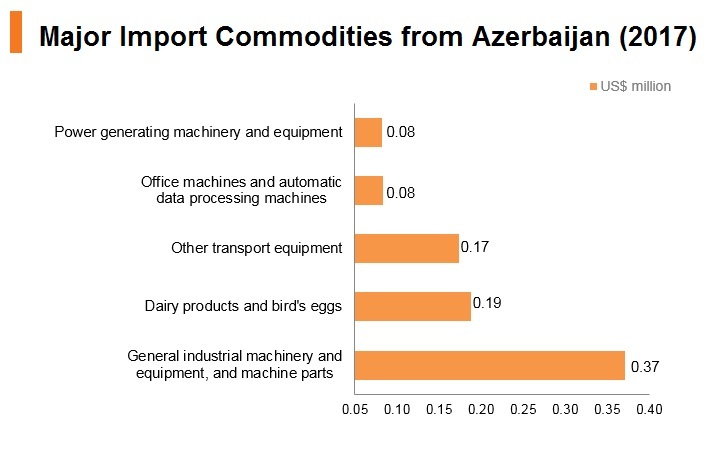 Azerbaijan's exports remain heavily dominated by oil and petroleum-based products. 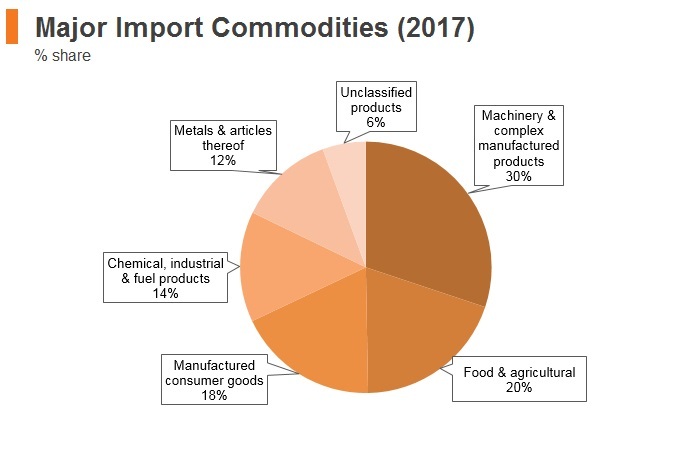 According to available data, exports have an estimated value of USD17.5 billion, accounting for 40.5% of GDP, with chemical, industrial and fuel being the most important export product (89%). Azerbaijan's over-dependence on hydrocarbons has made it difficult to expand other sectors of the economy. 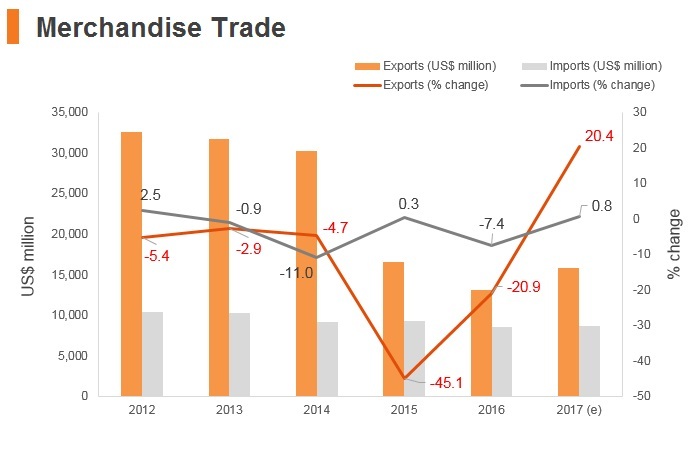 As a result, other product exports remain relatively small, all less than USD1 billion, altogether. 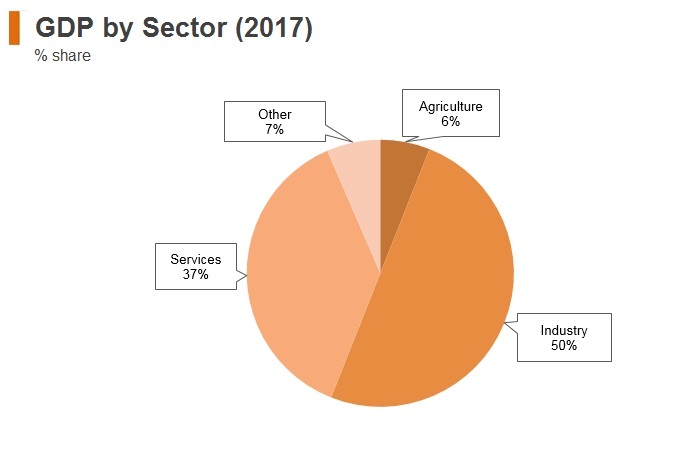 Of that, Agriculture is an important component of Azerbaijan's non-oil economy and has significant potential to boost export revenues for the country. Following the privatisation of farm properties in the post-Soviet economy, the focus of Azerbaijani agriculture shifted to producing profit-yielding crops, such as grain, potatoes, vegetables and fruits and berries. The value of total imports in Azerbaijan is estimated at USD17.6 billion, accounting for 40.5% of GDP based on currently available data. This figure is high by historical standards, with imports expanding from 20.7% of GDP in 2010. 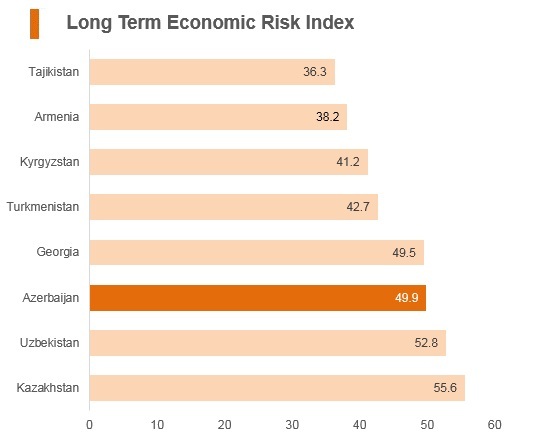 The secondary economic sector in Azerbaijan remains largely underdeveloped. As such, the country is heavily dependent on manufactured products imports. Azerbaijan applied for World Trade Organization (WTO) membership in June 1997 and currently holds observer status in the WTO. It uses the internationally accepted classification system whereby the value of goods for customs procedures is determined in line with the general principles of the WTO. 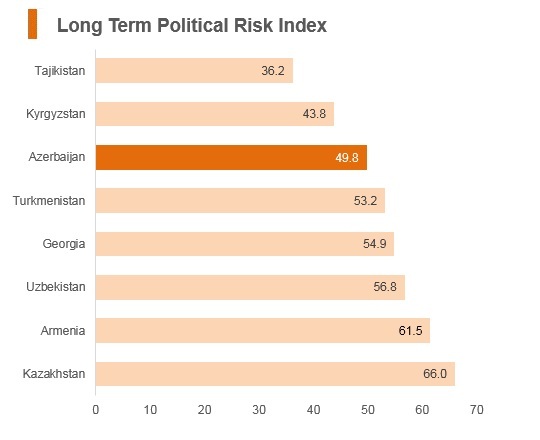 Regionally, the average tariff rate in Azerbaijan is high at 5.3%, which is the third-highest, marginally ahead of Tajikistan. This is relatively uncompetitive in relation to a regional average of 3.3%. In the longer term, we expect to see a reduction or even a removal of tariffs for some countries trading with Azerbaijan as the country is undergoing WTO accession, while also pursuing increased cooperation with the European Union (EU), which is one of its major trading partners. Azerbaijan has shown a preference for bilateral agreements over multilateral trade associations and unions. For instance, Azerbaijan declined to sign the Association Agreement with the EU in the framework of the Eastern Partnership in 2014. Instead, it signed an agreement to simplify the visa regime with the EU, and so, the Neighbourhood Policy functions more as a political arrangement rather than leading to a free trade agreement. Likewise, the country has made clear its plans to stay outside the EU and has also chosen to remain outside of the Commonwealth of Independent States Free Trade Area (CISFTA), comprising Armenia, Belarus, Georgia, Moldova, Kazakhstan, the Russian Federation, Ukraine, Uzbekistan, Tajikistan and the Kyrgyz Republic. Azerbaijan has signed agreements on mutual protection of investments with 39 countries and on the avoidance of double taxation with 40 countries. Azerbaijan has bilateral investment protection agreements with the following countries: Austria, Belarus, Belgium, Bulgaria, China, Croatia, Egypt, Estonia, Finland, France, Georgia, Germany, Greece, Iran, Israel, Italy, Jordan, Kazakhstan, Korea, Kyrgyzstan, Latvia, Lithuania, Lebanon, Moldova, Norway, Pakistan, Poland, Qatar, Romania, Saudi Arabia, Syria, Switzerland, Tajikistan, Turkey, UAE, Ukraine, the UK and Uzbekistan. The latest round of negotiations on the new comprehensive partnership agreement between the EU and Azerbaijan (The EU-Azerbaijan trade and political agreement) were held in May 2018. Whilst there is no deadline for these talks, The EU-Azerbaijan Parliamentary Cooperation Committee (PCC) announced in May 2018 that the agreement will be ready for ratification in 2019. The new agreement should replace the 1996 partnership and cooperation agreement and should better take account of the shared objectives and challenges the EU and Azerbaijan face today. The new EU-Azerbaijan bilateral Agreement is supposed to cover all political, economic, social and cultural sides to our relations, including trade and investment, human rights and rule of law, education, environment and other sectoral cooperation, including in energy and transport. 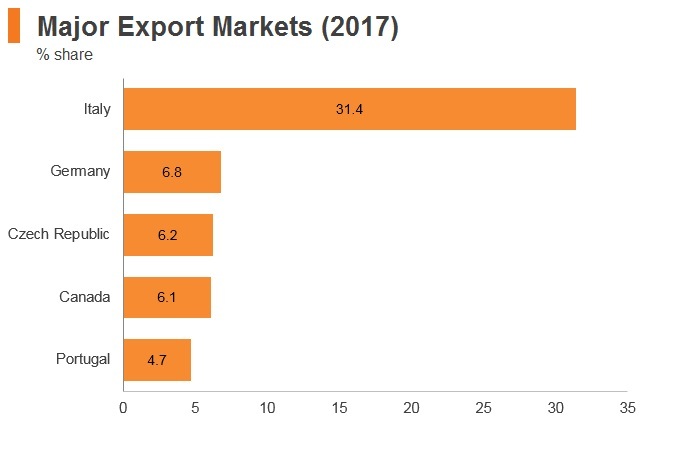 The Russia-Azerbaijan Free Trade Agreement: Trade volumes in 2014 stood at an estimated USD2 billion, and Russia is a net exporter to Azerbaijan. The Georgia-Azerbaijan Free Trade Agreement: Azerbaijan is the second-largest foreign trade partner of Georgia. 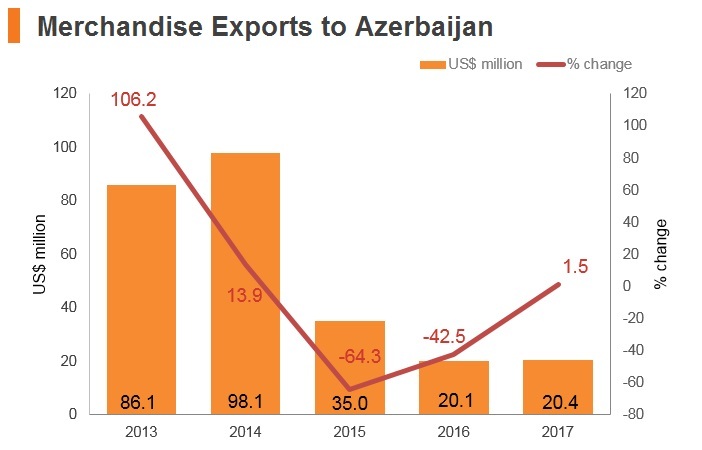 The trade turnover between Georgia and Azerbaijan stood at about USD188 million in 2014. 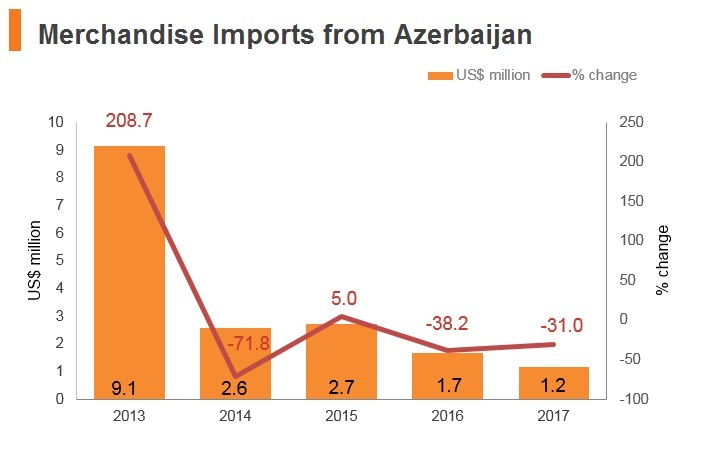 Georgia exported goods worth more than USD74.5 million to Azerbaijan, while it imported over USD113.1 million worth of Azerbaijani goods and services. 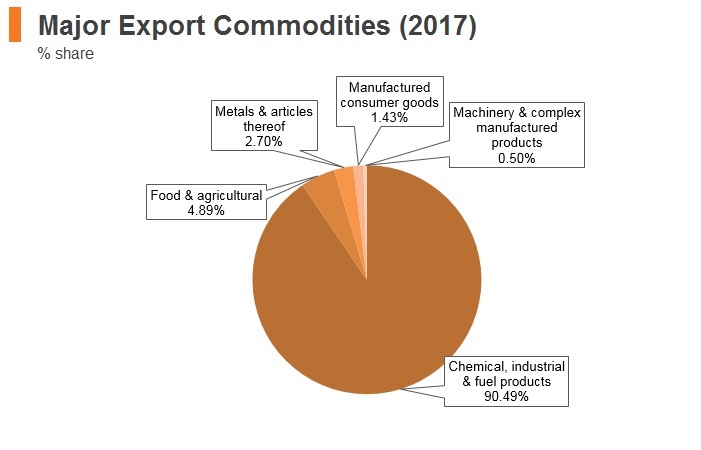 Azerbaijan mainly exports petroleum, petroleum oils and gases, gypsum, anhydrite, plaster and other products to Georgia; while motor cars, live bovine animals, bars and rods of iron and cement are the most imported goods from Georgia to Azerbaijan. The Ukraine-Azerbaijan Free Trade Agreement: Trade volumes between the two countries stood at an estimated USD420 million in 2014. Key areas include agricultural products, machinery, boilers, articles of iron or steel and other manufactured goods. 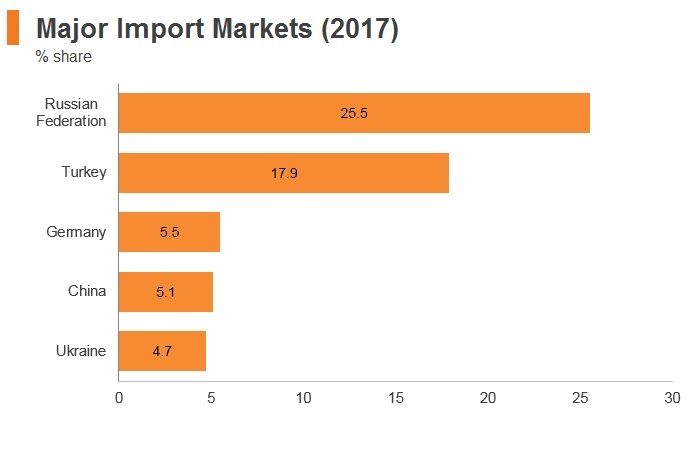 Azerbaijan exports raw materials, such as fuel products to Ukraine; and Ukraine was a net exporter to Azerbaijan in 2014. The Uzbekistan-Azerbaijan Free Trade Agreement: The Agreement, set up in 2015, stresses the importance of expanding bilateral relations between the business communities of both countries, and implementation of joint projects to enhance economic cooperation. Black Sea Economic Cooperation (BSEC) - Albania, Armenia, Bulgaria, Georgia, Greece, Moldova, Romania, Russia, Turkey, and Ukraine: The BSEC came into existence as a unique and promising model of multilateral political and economic initiative. Cooperation areas include transport, communications, informatics, product standardisation and certification, energy, mining, processing of mineral raw materials, tourism, agriculture and agro-industries. This agreement continues to bolster trade between member states. Azerbaijan chairs BSEC in 2018. Bilateral Free Trade Agreements (FTAs) with China and Azerbaijan: FTAs between the two countries are still under negotiation. The impact of regional integration is significant, especially for small open economies, such as Armenia, Azerbaijan and Georgia, which, together, comprise the South Caucasus, entering into an FTA with a large economy such as China. At the same time, the FTA will have mutual economic and geopolitical benefits for all participant countries, as China is a significant global consumer of fuel products and raw materials, which constitute over 90% of Azerbaijan's export basket. The CISFTA: CISFTA is a free trade area between Russia, Ukraine, Belarus, Uzbekistan, Moldova, Armenia, Kyrgyzstan and Kazakhstan. Azerbaijan's economy will benefit from the country entering the free trade zone. The nation's products - particularly fruits and vegetables, which are already popular in CIS countries - will be much easier to export. The free trade zone area was designed to reduce all trade fees on a number of goods between participating countries. Overall, the move will induce investments into Azerbaijan's economy, ease trade and stimulate employment. EU-Azerbaijan Partnership and Cooperation Agreement: The EU's bilateral trade relations with Azerbaijan are governed by a Partnership and Cooperation Agreement (PCA). In terms of trade, these are non-preferential agreements - ensuring most-favoured nation treatment and prohibiting quantitative restrictions in the bilateral trade. 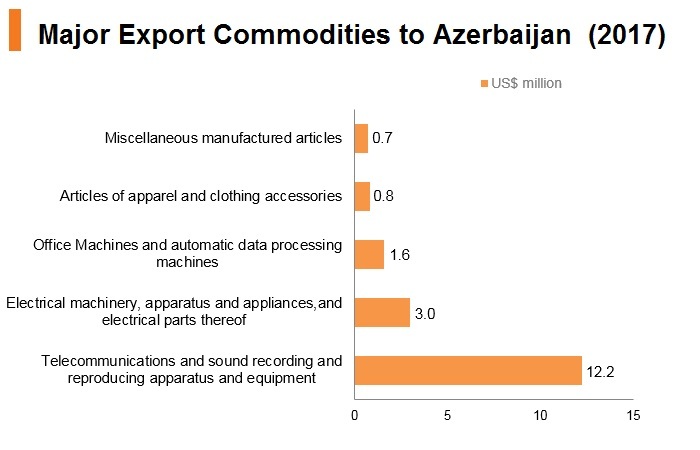 Azerbaijan would benefit from this agreement, since the EU accounts for over 50% of Azerbaijan's total trade volumes. The PCA envisages progressive regulatory approximation of legislation, and practices to the most important EU trade-related standards, including technical regulations, intellectual property rights' protection and customs issues. This should lead to better access to the EU markets for goods. Ratification is contingent on the Azeri government's willingness to change regulations in line with EU standards. The EU has shown willingness to negotiate a Deep and Comprehensive Free Trade Agreement with Azerbaijan, contingent on the country joining the WTO. Azerbaijan welcomes FDI, and the country has attempted to boost its investment profile on the international stage. However, key structural challenges facing the economy are hampering the development of non-oil sectors. In spite of this, there has been an increasing amount of interest in the country, particularly from other emerging markets. 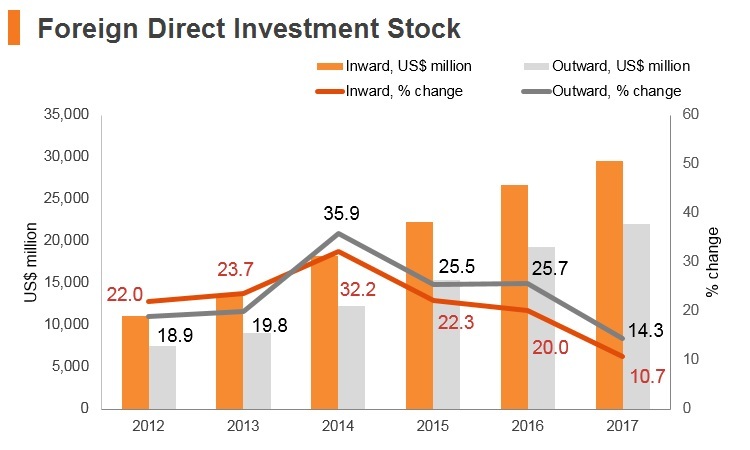 The foreign investment regime in Azerbaijan has been liberalised in recent years, as part of President Ilham Aliyev and his government's commitment to diversify the economy and to make the country more attractive in the international marketplace. Foreign investors are free to engage in investment activities in most sectors. However, foreign citizens and organisations may not own land, and may, instead, only lease it, which affects the security and cost of investment in many sectors. 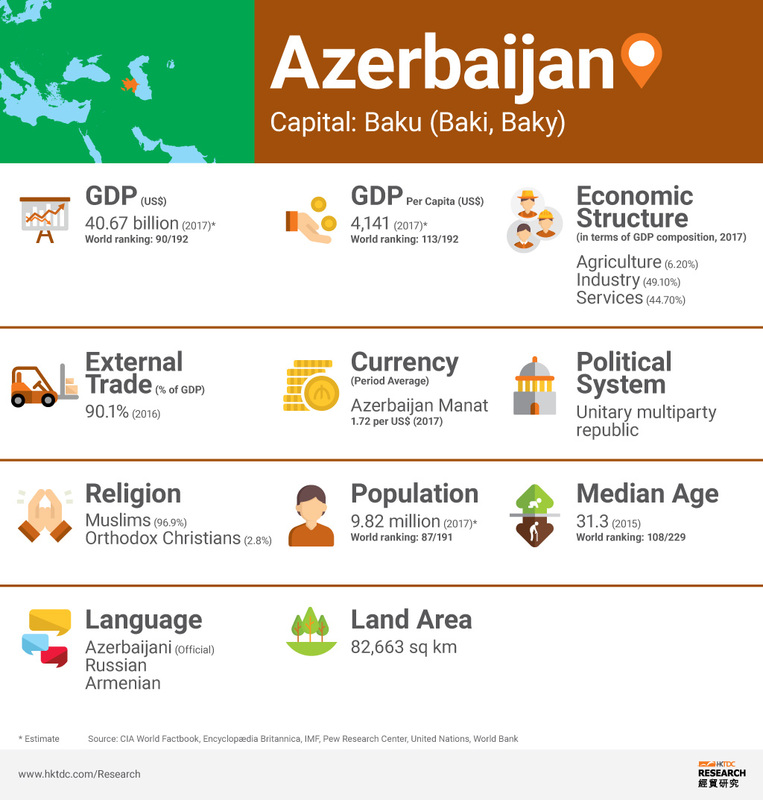 Under Azerbaijani law, foreigners may freely establish, acquire and dispose of interests in business enterprises and so, technically, there are no foreign equity limits. Investors may engage in the privatisation of government-owned properties, and can invest in the private sector through joint ventures with local companies or by establishing subsidiaries that are wholly-owned, as well as through representative offices and branches of foreign legal entities. Azerbaijani law also offers foreigners a 10-year protection provision in the event of new, less favourable legislation being implemented, thereby shielding foreign investors and keeping the country an attractive investment prospect. This does not, however, apply to tax legislation, which poses considerable risks in the event of significant corporate tax hikes. Foreigners legally enjoy investment freedom; however, in practice, access to markets, credit and other business operations is often impeded by cumbersome bureaucratic roadblocks. Certain industries are faced with licencing and heavy regulatory requirements, while institutional corruption and a 'favour' culture are widespread. Sumgait Chemical Industrial Park Investors benefit from the availability of universities specialising in scientific studies; a vocational school on site specialised in the field of chemistry, mechanics and construction; a specific laboratory on site supplied with modern equipment; skilled scientific personnel, full range of analytical services, laboratories, strong R&D network, on-site tests; seven different workshops that will serve R&D and studies. Investors also receive support in getting established through the availability of a one-stop-shop; support in receipt of technical conditions, permits, licences; work permits; environmental monitoring and seven-year tax holiday from: corporate income tax; property tax; land tax; and value added tax (VAT) on imported equipment. Balakhani Eco-Industrial Park This zone is strategically located and investors benefit from the Bypass roadway connecting with Balakhani-Binagady Highway. Investment incentives include exemption from corporate and income taxes for seven years after registration, exemption from real estate taxes, VAT for facilities and goods imported for production purposes and land taxes for seven years after registration. There are also streamlined procedures through a one-stop service for administrative issues and favourable tariff costs for utilities. In 2018, the number of firms operating in the park will double from five to ten. The new firms are involved in the polyethylene, cooking oil and waste, plastic, paper sectors. High-Tech Park (HTP) - for fields such as mobile technologies, information technologies, software engineering, space and telecommunications, robotics and mechanics, LED technology, biotechnology, research in energy efficiency, alternative energy and other innovations Investors benefit from the availability of office spaces along with R&D and assembly facilities that will be made available for eligible resident and partner companies. Both local and international academic institutions will be signed on as partners to provide training for resident and partner employees and also generate a streamlined, local and qualified workforce. Start-ups, residents and partner companies will be provided a very wide range of business support services, varying from business plan development to local marketing, from sourcing support to investor relations. Residents and companies operating in HTP are eligible to rent subsidised offices, facilities and land. Residents and companies operating in HTP are exempt from paying the 18% VAT on imported infrastructural and technological goods and services. Residents and companies located in the HTP land are freed from profit taxes for the seven-year period they operate in the park. There are no proposed changes to tax laws or rates in the 2018 Budget proposals. According to the Azerbaijani government, there are three distinct tax regimes that are applicable in the country, namely the statutory regime, the tax regime applicable to oil hydrocarbon companies and mining companies operating under the Production Sharing Agreements (PSAs), and the tax regine for companies working under the Host Government Agreements (HGAs). Currently there are 24 signed and ratified PSAs and two HGAs (with each agreement having its own separate tax regime). The Ministry of Taxes publishes a tax article covering the tax regime for that particular agreement, because there are differences between agreements besides differing tax rates (eg, taxation of foreign subcontractors) or reporting requirements. Furthermore, tax protocols for each PSA and HGA, outline specific guidance regarding how to pay the taxes and file reports. Citizens of the following nine countries can visit Azerbaijan without a visa for up to 90 days: Belarus, Georgia, Kazakhstan, Kyrgyzstan, Moldovia, Russia, Tajikistan, Ukraine and Uzbekistan. Citizens of the following countries can obtain a visa for Azerbaijan on arrival, valid for 30 days, at any international airport: Bahrain, China, Indonesia, Israel, Japan, Kuwait, Malaysia, Oman, Qatar, Saudi Arabia, South Korea, and UAE. Azerbaijan operates a quota for migrant workers, which was set at 12,000, and the government encourages businesses to hire from the domestic labour pool unless specialist skills are required which cannot be supplied by the Azeri labour market. This makes it more difficult to import skilled foreign workers, as there is an imposed limit on work permits for expatriates. Generally, in order to obtain a work permit in the country, a foreigner must have at least five years' experience in the field. This blocks the flow of unskilled workers from abroad and boosts a more effective use of local labour. On the positive side, the process of obtaining permits for foreign workers has been streamlined since the introduction of the 'one window' service, whereby applications are submitted to one government department, the State Migration service, which then works with other agencies to issue work permits and other necessary documentation. This eases the bureaucratic burden of employing foreign workers. 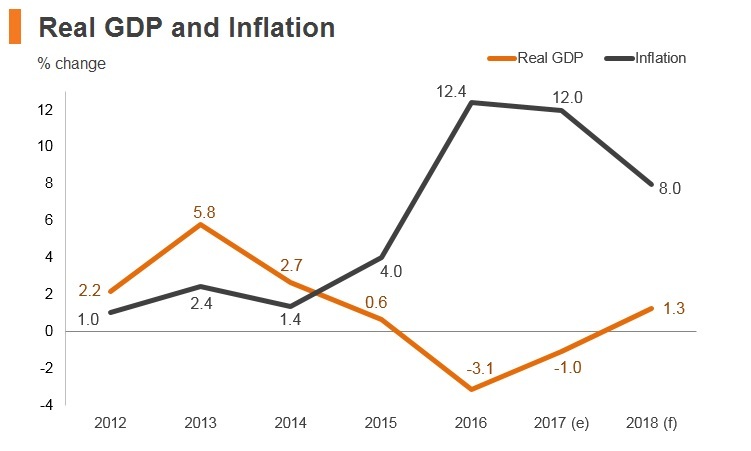 The economic growth outlook for Azerbaijan remains subdued, as the country will remain overwhelmingly dependent on oil and gas revenues for GDP growth. Over 75% of Azerbaijan's exports and 40% of its economic output rely on energy. It is, therefore, expected that the government will gradually carry out its economic diversification and privatisation plans. A major risk to the economy will continue to be banking sector weakness, which will require further capital injections from the central bank and result in subdued loan growth, weighing on economic activity. 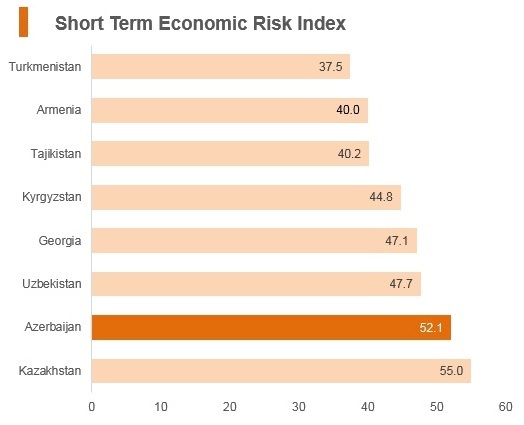 Azerbaijan’s lack of direct access to international maritime trade routes and the fragile security situation in the Nagorno-Karabakh region, heighten risks for investors. Its oil-reliant economy has been hit by a series of negative shocks - particularly a marked drop in global oil prices. 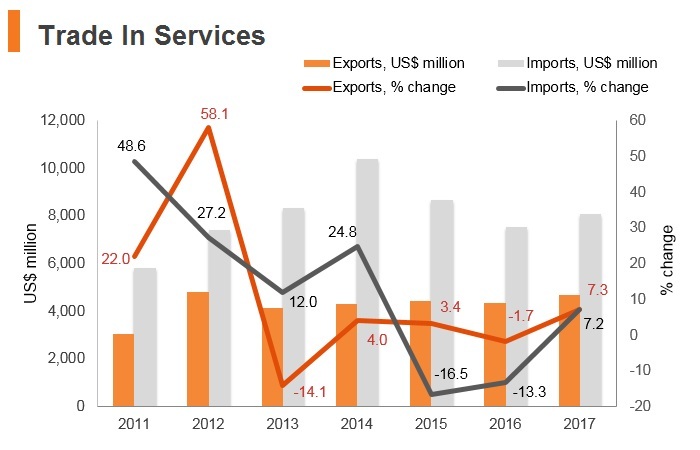 Muted economic growth, liquidity challenges and trade balance pressures will weigh on Azerbaijan in the medium term, despite low labour and utilities costs. 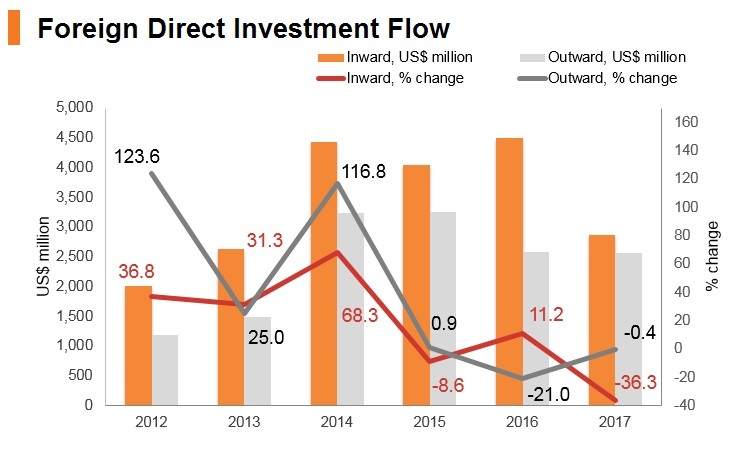 Nevertheless, the government continues to invest in infrastructure and is keen to attract foreign investment to diversify its economy, thereby decreasing its long-run exposure to commodity price shocks. A Bilateral Investment Treaty exists between China and Azerbaijan. The Bilateral Free Trade agreements between China and Azerbaijan are still under negotiation. Hong Kong residents are required to apply for a visa to visit Azerbaijan.